Let me be the first to admit that I am not always the most creative person. This is one of the reasons why I love that fabulous time-sucker called Pinterest. It has been my friend in the kitchen, the craft arena, and the organization of my home. Last year, I found an idea that I HAD to try. We are trying to cultivate an attitude of gratitude within our home, and this idea fit perfectly within that. My whole family was on board with the idea…which, looking back, perhaps was the very first miracle of the year. 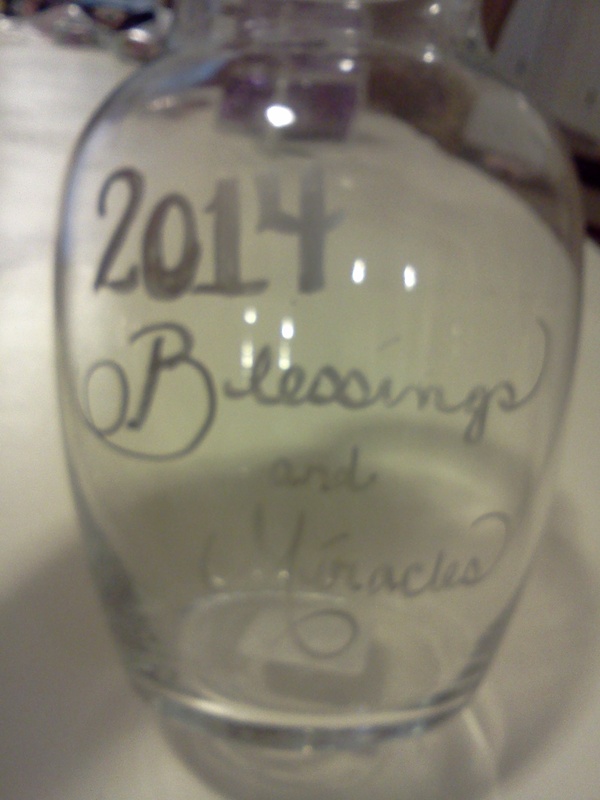 We created a jar that sat on our kitchen counter this past year, and in it we placed notes about blessings and miracles that happened over the course of 2013. Within just the month of January alone, we had that jar half-filled. 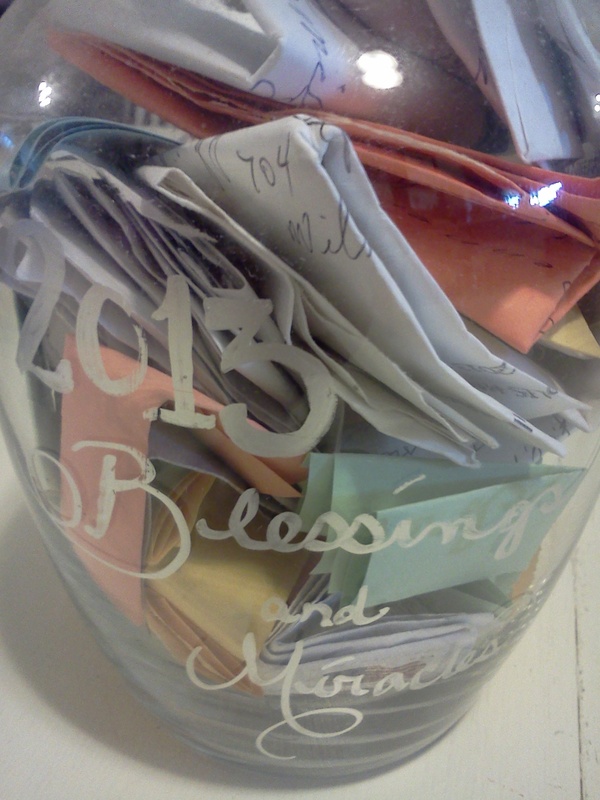 On December 31, 2013, we read through every slip of paper within that jar, and gave praise for the abundance of blessings in our life this past year. 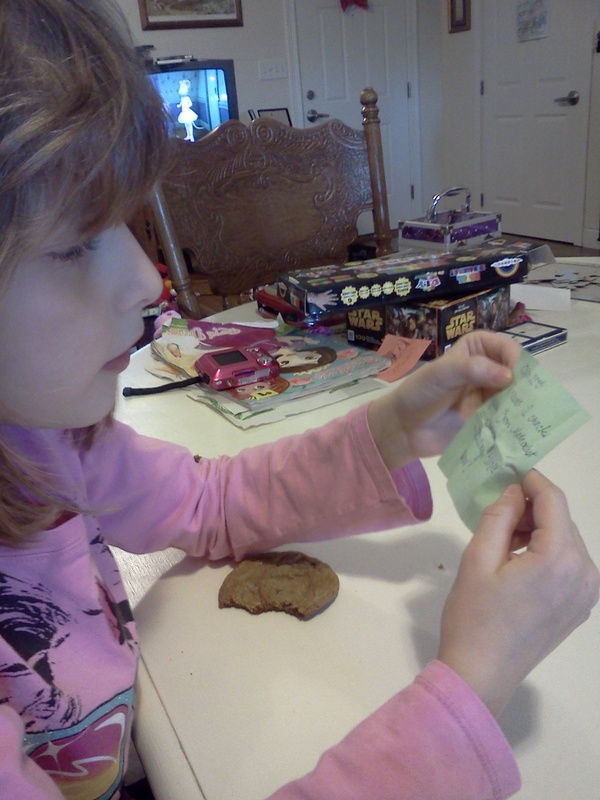 Every year, January seems to be the hard month for our family, and 2013 was no exception. We battled illness and injury, with three emergency room visits within the space of one week for two of our children. Our son suffered from an illness no one could diagnose, but the guesses doctors made included life threatening diseases. Praise God, none of those were his illness, and after a month he was back to his normal self, the medical world labeling it as “unknown.” But let me tell you, when your pediatrician (the doctor himself, not the office secretary or his nurse) calls you and tells you to take your child immediately to the emergency room to have him checked out, you go, and you go quickly, with your heart in your throat. All you can do is pray and give it to God, because you realize how impotent you truly are, how little you can do but pray and pray hard. You realize how precious, how fragile, the threads that hold us to this world are. Each and every day in January, we saw miracles happen, as test results came back negative, heart tests were normal, people helped us out with our other children and their care, meals were delivered, prayers were answered, and gifts were given to help support us. We were showered in blessings, and we were overwhelmed. The months went by, each one bringing new gifts, new miracles. There were the intangible, wonderful blessings. Blessings of new friendships, and depth in the relationships that already were. Blessings of health. Blessings of experiences. Blessings of growth, both physical and spiritual. And the tangible…people we didn’t even know sent monetary gifts to us, and it always seemed those gifts showed up JUST when we needed them. When you live on student loans and part-time jobs, money is always tight. And yet, this seems to be where God continually shows us favor, shows us mercy. The van needs $150 in repairs…the next day that exact amount shows up in our mailbox. The heating bill is way over what we budgeted for the month….I am able to work extra hours the following week and make EXACTLY the difference that is needed. 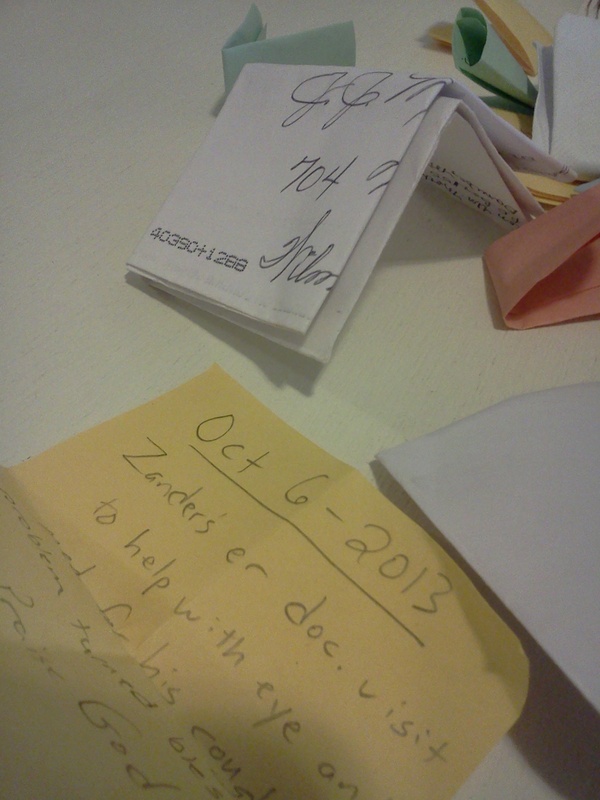 Crazy things like that happened a lot this year, and I am glad that we wrote them down, documenting the miracles. Reading through all of these notes that we had written over the course of a year gave us time to remember, time to reflect. It can be so easy to forget those little blessings….a friend stopping over to give you a hug at just the right time, a meal delivered on a day when the fridge and your wallet is empty, an offer to watch your children so that you can go for a walk by yourself. (Yes, for a stay at home mom, THAT is a huge blessing!) These are all things that would have been forgotten had we not written them down. Some of the miracles that we put in our jar would be considered small and insignificant by many people…but they weren’t. Not when they were offered. Not when they were given. 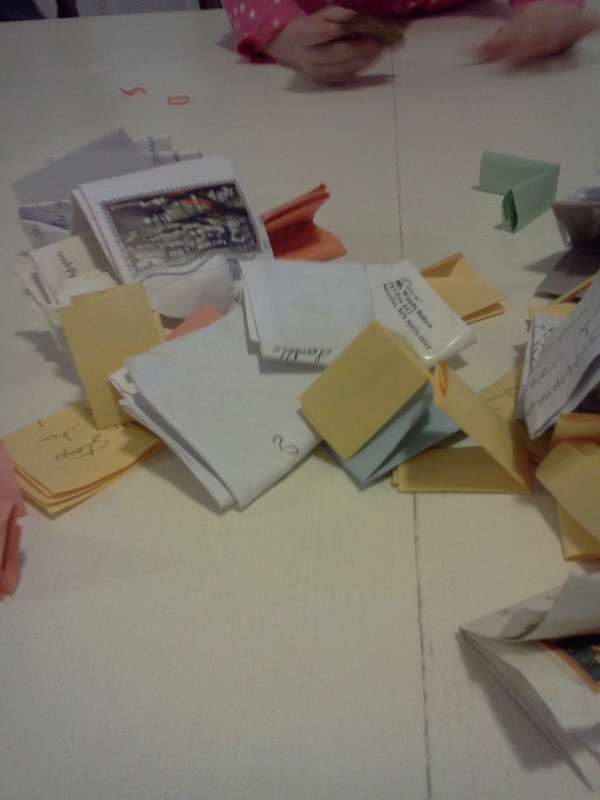 Reading through these slips of paper on the last day of the year was a blessing in itself. It gave us closure of the year in the way that we never had before. Being able to see, to reflect, on the abundance of the good in our lives, the way we have been loved by others, by God. It was a way to end a year with grateful hearts, and start a new year with joy and peace, knowing that we are bathed in love and mercy. We were overwhelmed as we looked at the whole of the year, in all of it’s ugly beauty. It seemed as though the miracles were preceded by hardship. Those were the days we were made more aware of the mercy. When the days were hard, and we were struggling, those are when God makes clear His love. And we give thanks for all of it. With grateful hearts, we move forward into this new year, ready once again to be more aware of those blessings in our world, large and small. We are ready to fill our jar once again, knowing that our thanksgiving..even in the hard times…is it’s own miracle of faith.